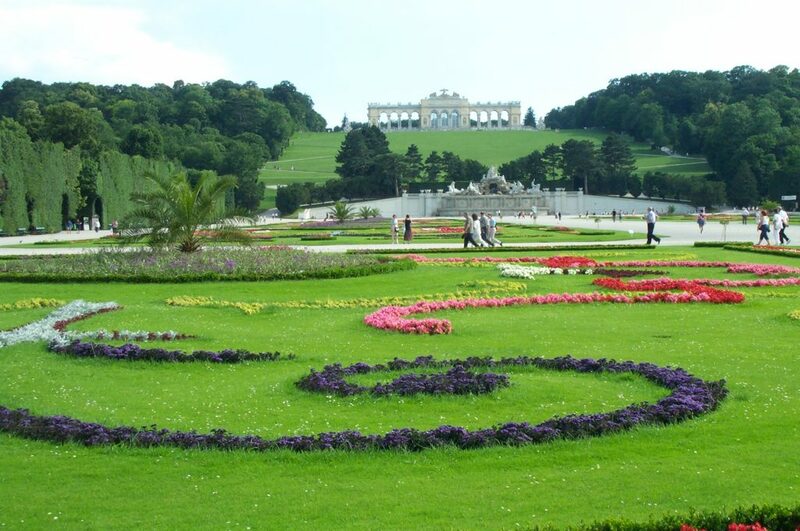 Schönbrunn Palace is both a museum and a park, and what a large park it is! Brilliant decorated with flowers spread out in intricate designs, the Palace gardens are a joy to look at, as you can see in the first photo. 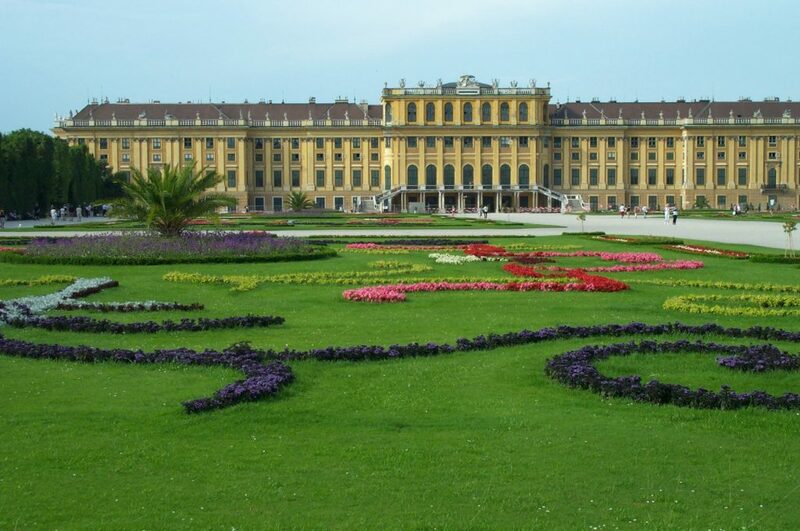 Schönbrunn Palace is located about a mile to the west of the Museum Quarter. I chose to walk, which took me roughly a half-hour. There wasn’t so much to see along the way, so taking the public transportation is recommended. The Palace building itself, shown in the first photo above, is quite an incredible structure. It was colored brilliant golden yellow as this was the favorite color of a former Austrian queen, and was built up from a sports lodge catering to nobility to the summer home of Austrian royalty (along with being the deathbed of Austria’s last emporer). The royal apartments are now a museum, and well worth a visit particularly to get the history of the waning years of the Austro-Hungarian Empire before World War I. The museum celebrates the palace’s best-known tenant, Emporer Franz Josef I (note 1) who lived there much of his life. As the museum told his story, Franz Josef was very much loved by the people and had a strong belief in maintaining connection with them. He was not above allowing commoners to come into his quarters to express grievances or offer suggestions for the good of the empire. He was also a believer in the virtue of hard work — I recall that the tour guide (who spoke in English) described his workday as typically beginning at 5:30 AM and ending late at night, taking only Sundays off. While admirable, my own perspective of history suggests that the troubles of the Empire (especially because of its volatile ethnic situation) were probably better solved by someone with a different work habit. We’ll never know. The museum also devoted considerable attention to one of Franz Josef’s wives, “Sissi,” or Queen Elizabeth of Austria. In my travels to Hungary and the Czech Republic, I noted Sissi’s name being mentioned in various palaces or museums. It seems that she was well liked, perhaps both by royalty and commonfolk. However, the Schönbrunn museum openly told the sad story of Sissi’s poor mental (and eventually physical) health — including a 19th century-style eating disorder where her only sustenance during the day was strained raw beef juice so she could stay thin. Having finished the museum tour, I went outside to walk the beautiful grounds. The first buildings I visited was the Orangerie and the Schönbrunn Cafe toward the grounds entrance. The Orangerie was practially orange in color and had a fresh paint job. The Cafe was a good place for lunch before the walk ahead. The second photograph above shows the main palace garden from the back of the palace to the Gloriette in the distance. From the floral patterns, you would probably deduce that the first two photographs were taken almost from the same spot but in opposite directions — and you would be right. The remarkable features of the gardens here were the impressive array of hedges on both sides (you can see a little from the left side of the second photo) — very tall and cut almost perfectly to appear like a single green wall. The stony structure in the near distance in the Neptunor (third photograph above), a large stone fountain and multi-level pool. One might get the mistaken impression that the Gloriette, shown in the next photograph below, is closer than it really is. In fact, it was one heck of a hike up a steep hill to get to it. The Gloriette is just a decorative arch that lords over the grounds, but now merely serves as a hi-brow cafe. Off the sides of the photograph are four very large statues of Austrian warriors that guard the side entrances. 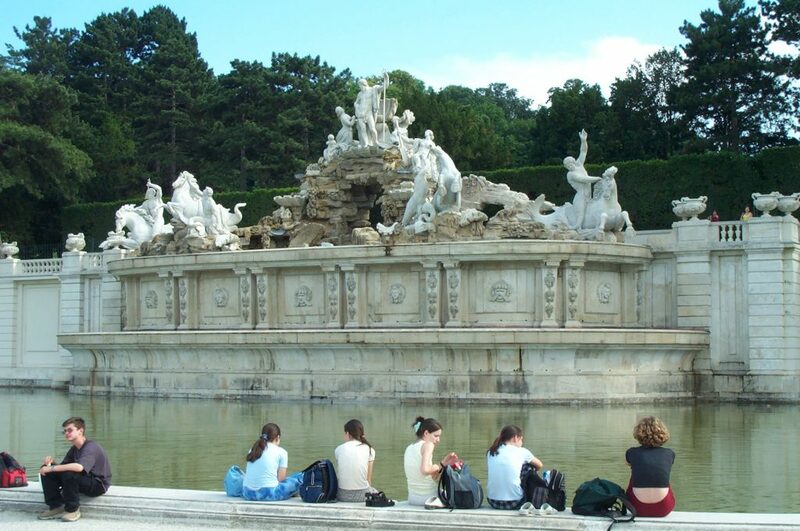 The Palace grounds have many other features — most notably the old Viennese city zoo. I call it old because it has been continuously active since 1852, which was amazing since it was hard hit during both World Wars. Several museums elsewhere in Vienna make special reference to the zoo, citing its role as introducing the giraffe and other African ‘oddities’ to the European landscape. 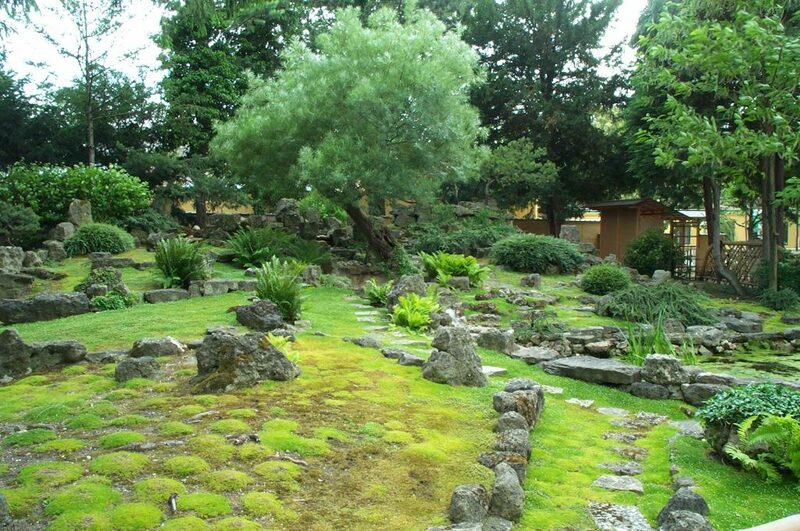 There were also two botanical gardens, one of which is shown in the fifth photograph below. The church in the distance is actually outside the Schönbrunn grounds, but it complemented the scene very well nonetheless. 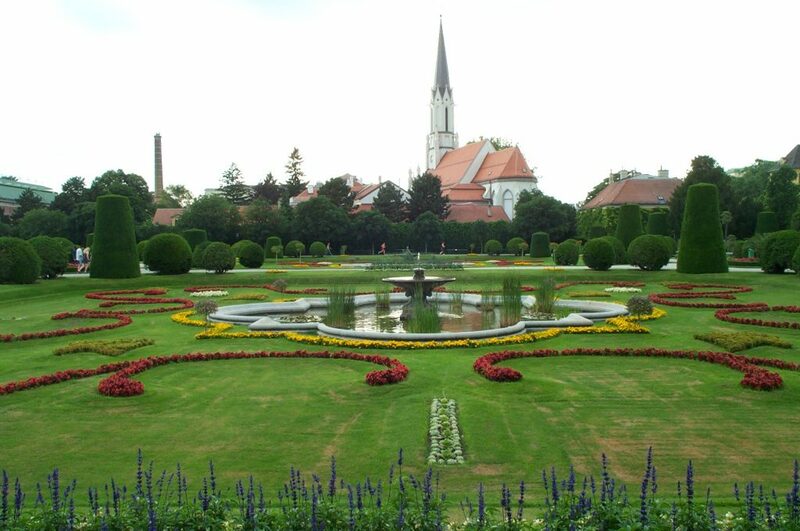 There were also plenty of artificial roman ruins (a common feature among European palace gardens), plenty of monuments and memorials to various Austrian figures, and numerous small cafés and restaurants. The last shot is from inside the Japanese Garden. So-called “Japanese Gardens” were a staple of palace grounds around Europe, perhaps because the special plants, flowing waters, and gentle landscapes were soothing – at least that was my reaction walking through them. I made my way around the park to the front of the Schönbrunn Palace, where I saw a rather fantastic spectacle. On the marble steps that graced the palace entrance was dressed a troupe of singers and performers dressed in period costume (by “period”, of course I mean the glory days of the mid-19th century). Among them were several children cutely dressed in old-style dresses. I unfortunately got there at the end, and thus could not follow what they were doing beyond posing for photographers from the horde of tourists. 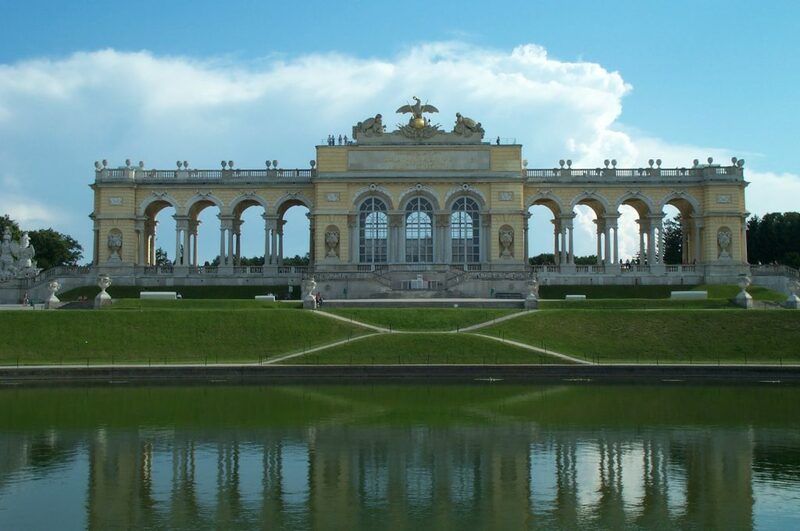 Certainly while downtown Vienna has plenty enough going for it in terms of attractions and history, a visit to the outskirts and the Schönbrunn Palace is a must for any visitor. Clearly it is one of the more impressive palaces around and a sheer joy to walk through.